For other uses, see Drop kick (disambiguation). Not to be confused with dropkick. Drop kicks are most importantly used as a method of restarting play and scoring points in rugby union and rugby league. Association football goalkeepers also often return the ball to play with drop kicks. The kick was once in wide use in both Australian rules football and gridiron football, but is today rarely seen in either sport. The drop kick technique in rugby codes is usually to hold the ball with one end pointing downwards in two hands above the kicking leg. The ball is dropped onto the ground in front of the kicking foot, which makes contact at the moment or fractionally after the ball touches the ground, called the half-volley. The kicking foot usually makes contact with the ball slightly on the instep. In a rugby union kick-off, or drop out, the kicker usually aims to kick the ball high but not a great distance, and so usually strikes the ball after it has started to bounce off the ground, so the contact is made close to the bottom of the ball. In rugby league, drop kicks are mandatory to restart play from the goal line (called a goal line drop-out) after the defending team is tackled or knocks on in the in-goal area or the defending team causes the ball to go dead or into touch-in-goal. Drop kicks are also mandatory to restart play from the 20 metre line after an unsuccessful penalty goal attempt goes dead or into touch-in-goal and to score a drop goal (sometimes known as a field goal) in open play, which is worth one point. Drop kicks are optional for a penalty kick to score a penalty goal (this being done rarely, as place kicks are generally used) and when kicking for touch (the sideline) from a penalty, although the option of a punt kick is usually taken instead. In rugby union, a drop kick is used for the kick-off and restarts and to score a drop goal (sometimes called a field goal). Originally, it was one of only two ways to score points, along with the place kick. Drop kicks are mandatory from the centre spot to start a half (a kick-off), from the centre spot to restart the game after points have been scored, to restart play from the 22-metre line (called a drop-out) after the ball is touched down or made dead in the in-goal area by the defending team when the attacking team kicked or took the ball into the in-goal area, and to score a drop goal (sometimes called a field goal) in open play, which is worth three points. Drop kicks are optional for a conversion kick after a try has been scored. This is rare, as place kicks are almost always used for the conversion; a drop kick is sometimes used late in a game if the scoring team needs to score again quickly, and taking a place kick would be slower. Also, if a gust of wind blows the ball over on a place kick attempt after the kicker has begun his run-up, thus allowing the opposing team to begin a charge down, then there is no time to reset the ball, and the kicker may attempt a quick drop kick. Drop kicks are also optional for a penalty kick to score a penalty goal. This is rare, as place kicks are almost always used. When kicking for touch (the sideline) from a penalty, a drop kick may be used. This is rare, as the option of a punt kick is almost always taken instead. The usage of drop kicks in rugby sevens is the same as in rugby union, except that drop kicks are used for all conversion attempts and for penalty kicks, both of which must be taken within 40 seconds of the try being scored or the award of the penalty. In both American and Canadian football, one method of scoring a field goal or extra point is by drop-kicking the football through the goal. It contrasts to a punt, wherein the player kicks the ball without letting it hit the ground first; and a placekick, wherein the player kicks a stationary ball off the ground: "from placement". A drop kick is significantly more difficult; as Jim Thorpe once explained, "I regard the place kick as almost two to one safer than the drop kick in attempting a goal from the field." 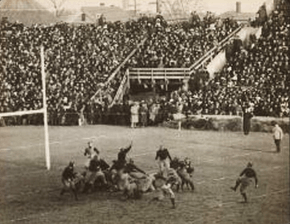 Brickley's drop kick to defeat Dartmouth in 1912. The drop kick was often used in early football as a surprise tactic. The ball would be snapped or lateraled to a back, who would fake a run or pass, but then would kick the field goal instead. This method of scoring worked well in the 1920s and early 1930s, when the football was rounder at the ends (similar to a modern rugby ball). 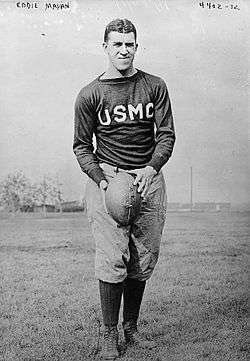 Early football stars such as Charles Brickley, Frank Hudson, Jim Thorpe, Paddy Driscoll, and Al Bloodgood were skilled drop-kickers; Driscoll in 1925 and Bloodgood in 1926 hold a tied NFL record of four drop kicked field goals in a single game. Driscoll's 55 yard drop kick in 1924 stood as the unofficial record for field goal range until Bert Rechichar kicked a 56-yard field goal (by placekick) in 1953. In 1934, the ball was made more pointed at the ends. This made passing the ball easier, as was its intent, but made the drop kick obsolete, as the more pointed ball did not bounce up from the ground reliably. The drop kick was supplanted by the place kick, which cannot be attempted out of a formation generally used as a running or passing set. The drop kick remains in the rules, but is seldom seen, and rarely effective when attempted. In Canadian football the drop kick can be taken from any point on the field, unlike placekicks which must be attempted behind the line of scrimmage. 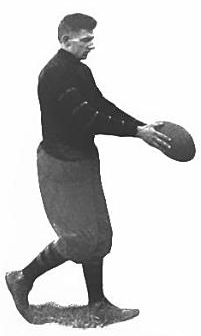 Before the NFL–AFL merger, the last successful drop kick in the NFL was executed by Scooter McLean of the Chicago Bears in their 37–9 victory over the New York Giants on December 21, 1941, in the NFL Championship game at Chicago's Wrigley Field. Though it was not part of the NFL at the time, the All-America Football Conference saw its last drop kick November 28, 1948, when Joe Vetrano of the San Francisco 49ers drop kicked an extra point after a muffed snap against the Cleveland Browns. Eddie Mahan preparing to drop kick. The only successful drop kick in the NFL since the 1940s was by Doug Flutie, the backup quarterback of the New England Patriots, against the Miami Dolphins on January 1, 2006, for an extra point after a touchdown. Flutie had estimated "an 80 percent chance" of making the drop kick, which was called to give Flutie, 43 at the time, the opportunity to make a historic kick in his final NFL game; the drop kick was his last play in the NFL. After the game, New England coach Bill Belichick said, "I think Doug deserves it," and Flutie said, "I just thanked him for the opportunity." Dallas Cowboys punter Mat McBriar attempted a maneuver similar to a drop kick during the 2010 Thanksgiving Day game after a botched punt attempt, but the ball bounced several times before the kick and the sequence of events is officially recorded as a fumble, followed by an illegal kick, with the fumble being recovered by the New Orleans Saints 29 yards downfield from the spot of the kick. The Saints declined the illegal kick penalty. New England Patriots kicker Stephen Gostkowski attempted an onside drop kick on a free kick after a safety against the Pittsburgh Steelers on October 30, 2011. The kick went out of bounds. New Orleans Saints quarterback Drew Brees, a former teammate of Flutie's, executed a drop kick late on an extra point attempt in the fourth quarter of the 2012 Pro Bowl; the kick fell short. New England Patriots special teams player Nate Ebner attempted an onside drop kick on a kickoff after a Patriots touchdown against the Philadelphia Eagles on December 6, 2015. The kick was recovered by the Eagles at their own 41 yard line. Two weeks later, on December 20, Buffalo Bills punter Colton Schmidt executed what is believed to be an unintentional drop kick after a botched punt against the Washington Redskins; because the Redskins recovered the kick, it was treated as a punt (and not as a field goal attempt, which would have pushed the ball back to the spot of the kick). The last successful drop kick extra point in the NCAA was by Jason Millgan of Hartwick College on December 11, 1998, St. Lawrence University. 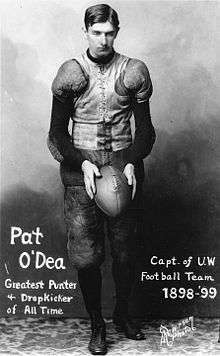 Frosty Peters of Montana State College made 17 drop kicks in one game in 1924. In the Canadian game, the drop kick can be attempted at any time by either team. Any player on the kicking team behind the kicker, and including the kicker, can recover the kick. When a drop kick goes out of bounds, possession on the next scrimmage goes to the non-kicking team. On September 8, 1974, Tom Wilkinson, quarterback for the Edmonton Eskimos, unsuccessfully attempted a drop kick field goal in the final seconds of a 24–2 romp over the Winnipeg Blue Bombers. This may have been the last time the play was deliberately attempted in the CFL. During one game in the 1980s, Hamilton Tiger-Cats wide receiver Earl Winfield was unable to field a punt properly; in frustration, he kicked the ball out of bounds. The kick was considered a drop kick and led to a change of possession, with the punting team regaining possession of the ball. In Arena football, a drop-kicked extra point counts for two points rather than one and a drop-kicked field goal counts for four points rather than three. The most recent conversion of a drop kick was by Geoff Boyer of the Pittsburgh Power on June 16, 2012; it was the first successful conversion in the Arena Football League since 1997. Once the preferred method of conveying the ball over long distances, the drop-kick has been superseded by the drop punt as a more accurate means of delivering the ball to a fellow player. It is, therefore, no longer used in the game as it is considered too unpredictable. ↑ "Kicking: The Drop Kick" at www.coachingrugby.com. Retrieved 11 October 2007. ↑ "Section 6: Scoring". The International Laws of the Game and Notes on the Laws (PDF). Rugby League International Federation. 2004-03-11. p. 14. Retrieved 2007-09-12. ↑ "Law 9: Method of Scoring" (PDF). Laws of the Game. International Rugby Board. 2007. Retrieved 2007-09-12. ↑ Billy Evans (December 3, 1926). "Place Kick Is best Method For Point". The Ogden Standard-Examiner. p. 19. Retrieved July 24, 2015 – via Newspapers.com. ↑ "Release » The last dropkick". Profootballhof.com. Retrieved 2013-10-02. ↑ "The Coffin Corner : Vol. No. 7 (1979) - A Closer Look: 50-yd DKs" (PDF). Profootballresearchers.org. Retrieved 2013-10-02. ↑ Borges, Ron (January 29, 2006). "A get-rich kick scheme fails". The Boston Globe. 1 2 Ulman, Howard. "Dolphins Win Sixth Straight Despite Flutie's Drop Kick". TheLedger.com. Retrieved 2013-10-02. ↑ "Flutie converts first drop kick since 1941 championship - NFL - ESPN". Sports.espn.go.com. 2006-01-02. Retrieved 2013-10-02. ↑ "New Orleans Saints vs. Dallas Cowboys - Play By Play - November 25, 2010 - ESPN". Scores.espn.go.com. 2010-11-25. Retrieved 2013-10-02. ↑ "Watch New Orleans Saints vs. Dallas Cowboys [11/25/2010". NFL.com. Retrieved 2013-10-02. ↑ "Polamalu punch vs. Patriots was illegal". CBSSports.com. Retrieved 2013-10-02. ↑ England, New (2011-10-30). "Patriots-Steelers Studs & Duds - Musket Fire - A New England Patriots Fan Site - News, Blogs, Opinion and more". Musket Fire. Retrieved 2013-10-02. ↑ "Hartwick College ESPN Drop Kick Field Goal". YouTube. Retrieved 2013-10-02. ↑ "BOBCAT ATHLETIC TRADITIONS". msubobcats.com. Retrieved August 9, 2016. ↑ Knighton, Tom (June 23, 2011). "A drop kick into history". ↑ Faulkner, Andrew (11 June 2011). "=Future direction of an evolving art form". The Australian.